Sunita Meena with her mother and father, Mrs. Mohini Devi and Mr. Kamlesh. The power of education is shining brightly on the village of Harirampura, Rajasthan. 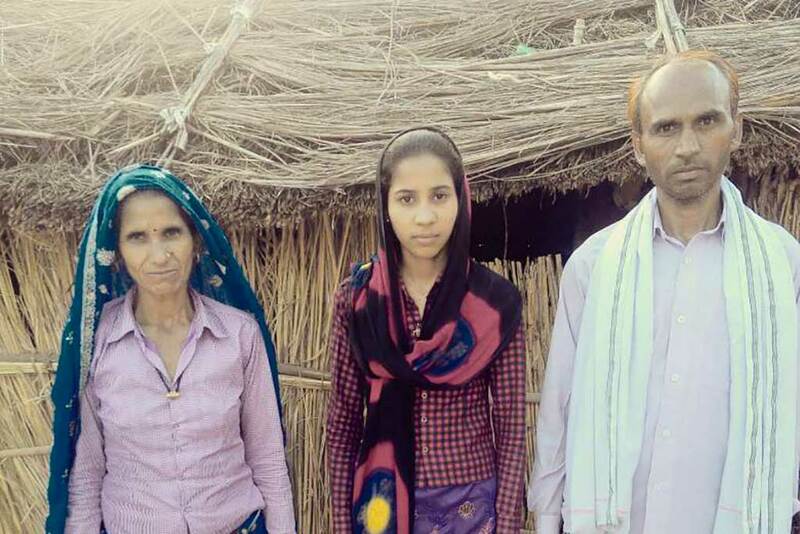 Sunita Meena is a young woman who scored 85% in XII (Arts) and so gained entry to the prestigious Maharani Gayatri Devi College for Women in Jaipur. The achievement is a big one for Sunita in many ways. In order to attend school, she had to walk 7 km up and down every day. Not even a cycle was available to her. Her study time was also difficult to squeeze in, given the other daily responsibilities she had in the household. In addition, girls are not supported in terms of pursuing a higher education. Their duties are to marry and then take care of children and the household. Sunita’s mother joined in and assured her daughter she has the potential to succeed and do very well in her studies. Finally, Sunita’s morale was boosted to the point where she decided to take the brave step forward. She started her college studies at the beginning of July.